Managing the entire lifecycle of oil and gas fields is challenging for all E&P companies, from the early stages of asset exploration and appraisal through production activities and the eventual sale or abandonment of a field. How well are your technical teams equipped to help them understand their geological and engineering data, and the uncertainty in that data? The answer to this question is important in that it determines a company’s ability to accurately estimate reserves and forecast production. Economic decisions are made based on these forecasts therefore, if asset teams fail to properly understand the reservoir, they provide inaccurate reserve estimates and poor development strategies to decision-makers. Landmark’s Reservoir Development Lifecycle is comprised of tools that help companies enhance their reservoir understanding and manage their asset’s lifecycle. Understand your asset’s potential and capture the uncertainty in that potential with earth modeling while pursuing the optimal economic outcome of developing your asset with reservoir simulation for evaluating the likely outcome of multiple development and operating plans. In the exploration and appraisal lifecycle, if the asset economics are confirmed for development the process then moves to the reservoir development lifecycle where detailed analysis and asset modeling provides information needed for strategic development planning. Asset teams gain understanding of their asset’s potential and uncertainty through reservoir characterization modeling, the process of integrating subsurface G&G data to create a static 3D earth model that provides critical information for the next phase of lifecycle activities. Residing on a single collaborative platform, Landmark’s DecisionSpace® Earth Modeling provides companies a way to seamlessly integrate all their G&G subsurface data to create a high resolution earth model in a cross-disciplinary effort while preserving data consistency. The resulting earth model offers a clear understanding of the reservoir geometry, and rock and fluid properties along with their uncertainty. Once you have characterized the reservoir, reservoir simulation is used to predict the potential flow of oil, gas, and water through the reservoir. The impact of proposed operating plans on recovery efficiencies can be modeled, from which an optimized plan can be devised and validated. The reservoir simulation model combines the earth model, well locations, and completion design, along with well controls imposed or proposed during the simulated time period. Predictions of future production can be made more accurate by including surface pipelines and facility behavior in the simulation model, and determining their potential effects on the performance of the wells. With Landmark’s Nexus Suite Reservoir Simulation, companies can create reservoir simulation models most representative of their assets behavior for field development strategies. Due to the uncertainty in the earth model properties, predictions based upon it will also be uncertain. To reduce earth model uncertainty, any historical production data that exists for the asset can be used in reservoir simulation to determine whether the field’s history is reproducible by the simulator based upon earth model properties. This calibration step, known as history matching, requires multiple simulation runs with properties chosen in accord with the distribution of properties in the earth model, and finding one or more sets of properties which lead to the observed well data being matched by the simulated wells. Companies can efficiently history match their reservoir simulation model against observed production data with Landmark’s Nexus® Suite Reservoir Simulation, and automate this process using Landmark’s Decision Management System™. 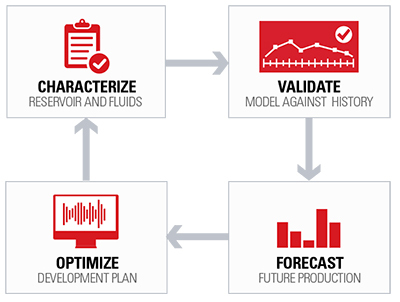 Once the reservoir simulation model has been satisfactorily matched to production history, the process now turns to forecasting production and development planning. Forecasting is performed from the end of the field history through the expected operating life of the field, using the history-matched model to predict future behavior. The most frequent scenario is to forecast the base case in which no additional wells are drilled. Landmark’s Nexus® Suite Reservoir Simulation not only provides companies forecasting capabilities for their reservoir simulation models but offers them the option to include surface facilities and pipelines to increase the accuracy of their future production forecasts for the life of the asset. Most companies will seek an optimized development plan once the base case forecast has been completed, with the goal of increasing asset value. This process involves proposing one or more development options (e.g., waterflooding or gas re-injection) which usually includes drilling additional wells. These development options are then modeled with multiple operating scenarios (different rates and pressures) which can be implemented in the field. Best practices dictate that development decisions should be made based on a comparison of forecasted behavior for various planned development options with the base case forecast. Production improvements, overall economics, field lifetime, and investment recovery time can all be considered, individually or in combination. With Landmark’s Nexus® Suite Reservoir Simulation and Decision Management System™, companies have the ability to find the development plan which provides the greatest potential asset value.